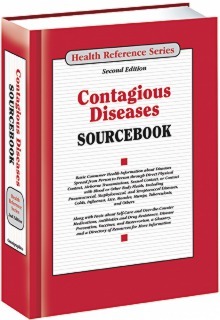 Contagious Diseases Sourcebook, 3rd Ed. Contagious diseases occur when microbes—bacteria, viruses, and fungi—are passed from person to person. Vaccination programs and other prevention measures have successfully reduced the number of new cases of many contagious diseases. However, in many industrialized countries where communicable disease mortality has greatly decreased over the past century, the return of old communicable diseases, the emergence of new ones, and the evolution of antimicrobial resistance that have made treatments less effective continues to present a challenge, and infectious disease remains a major public health concern in the United States and around the world. Contagious Diseases Sourcebook, Third Edition, provides updated information about microbes that are spread from person to person and the diseases they cause, including influenza, lice infestation, smallpox, measles, staphylococcal and streptococcal infections, tuberculosis, and others. The types of diagnostic tests and treatments available from medical professionals are explained, and self-care practices for familiar symptoms, such as common cold and sore throat are described. Antibiotic resistance, the role of hand washing in preventing the spread of disease, and recommendations and controversies surrounding vaccination programs are also described. The book concludes with a glossary of related terms and a directory of additional resources. This book is divided into parts and chapters. Parts focus on broad areas of interest. Chapters are devoted to single topics within a part. Part I: What You Need to Know about Germs describes various types of microbes and different kinds of infections. It explains how the immune system responds to germs and how diseases can be transmitted from one person to another. Public health issues are also discussed, including the practice of screening internationally adopted children for contagious diseases and the threat of bioterrorism. Part II: Types of Contagious Diseases provides facts about diseases of concern—from adenovirus to whooping cough—in individual, alphabetically arranged chapters. Part III: Self-Treatment for Contagious Diseases discusses frequently used remedies for common illnesses and disease symptoms. Facts about the proper use of over-the-counter (OTC) medications are included along with a chapter focusing on the dangers associated with drug interactions. The part concludes with information about the use of probiotics, herbal and dietary supplements, and other forms of complementary and alternative medicine. Part IV: Medical Diagnosis and Treatment of Contagious Diseases explains the tests and procedures used to identify the presence of microbial infection, including Streptococcus and Staphylococcus bacteria and viruses associated with colds, influenza, and other diseases. Antibiotic and antiviral medications are discussed, and the growing problem of antimicrobial resistance—the way microbes change to counteract the effectiveness of drug treatments—is explained. Part V: Preventing Contagious Diseases begins with information about a simple practice that is a key element in the fight against the spread of germs—hand washing. It continues with facts about vaccines, another effective tool for halting the proliferation of disease. Information about vaccine recommendations for children, adolescents, and adults is included, and this part also addresses problems associated with vaccines, the vaccine adverse event reporting system, and the difficulties that can arise as a result of vaccine misinformation. Part VI: Additional Help and Information provides a glossary of terms related to contagious diseases and a directory of resources for additional information. “The book is a continuation of the well-respected Health Reference Series and is the third edition of said book. "The book provides an educational experience for the reader. While books of this stripe are useful for reference purposes, it is a common temptation for books like this to be overinterpreted by the nervous reader. This book, when used properly, provides a good background for what a contagious disease is, and then begins to explore the specifics of each contagious disease. While all of the information in the book is useful, the book shines in its presentation of a chapter on each disease. Each chapter contains a quick introduction, the symptoms of the disease, the seriousness of the disease, whether the disease is contagious, the individuals at risk for the disease, whether the disease can be treated, and whether the disease can be prevented. Calling from Inside the U.S.